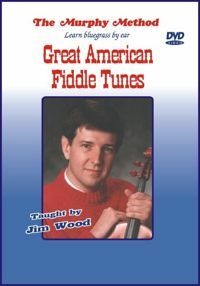 Great American Fiddle Tunes: So now you find yourself seriously interested in the fiddle. In that case, it’s time to start building your repertoire of fiddle tunes. You’ll want solid, professional versions that are still easy to learn by the budding fiddler that you are. These six tunes from the traditional fiddle catalog are a good place to start. Every fiddler worth her rosin is expected to know these. These also show up with regularity in bluegrass jam sessions. Still taught note-by-note. No Tab. Arkansas Traveler, Soldier's Joy, Golden Slippers, Westphalia Waltz, Old Joe Clark, Sally Goodwin.